INTRODUCTION TO COSMOLOGY - тема научной статьи по физике из журнала "Ядерная физика"
An introductory review on cosmology for students specializing in particle physics is presented. Many important subjects are not covered because of lack of space but hopefully the review may serve as a starting point for further studies. 1. A little about general relativity and its role in cosmology. 2. Four basic cosmological equations and expansion regimes. 3. The Universe today and in the past. 4. Kinetics in hot expanding world and freezing of species. 5. Inflation: kinematics, models, the Universe heating, and generation of density perturbations and gravitational waves. 7. Field theory at nonzero temperature and cos-mological phase transitions. 8. Baryogenesis and cosmological antimatter. 9. Neutrino in cosmology (bounds on mass, oscillations, magnetic moment, and anomalous interactions). 10. Dark matter and large scale structure. 11. Vacuum and dark energies. 12. Cosmic microwave radiation and cosmological parameters. In reality only a half of this plan was fulfilled. Nevertheless, the list presented above may be helpful as a guiding line for further studies. and cosmology in Section 2. Next, in Section 3 we will derive the basic cosmological equations in a rather naive way studying motion of nonrelativistic test body in spherically symmetric gravitational field. There we also talk about realistic regimes of the Universe expansion and basic cosmological parameters. In the next Section 4, the Universe history is very briefly presented. Section 5 is dedicated to thermodynamics and kinetics in the early Universe. 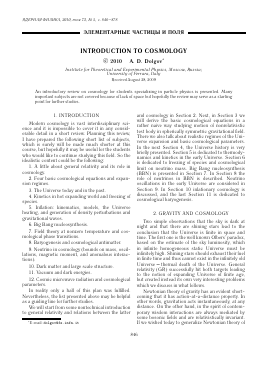 Section 6 is dedicated to freezing of species and cosmological limit on neutrino mass. Big Bang nucleosynthesis (BBN) is presented in Section 7. In Section 8 the role of neutrinos in BBN is described. Neutrino oscillations in the early Universe are considered in Section 9. In Section 10 inlationary cosmology is discussed, and the last Section 11 is dedicated to cosmological baryogenesis. Two simple observations that the sky is dark at night and that there are shining stars lead to the conclusion that the Universe is finite in space and time. The first one is the well known Olbers' paradox, based on the estimate of the sky luminosity, which in infinite homogeneous static Universe must be infinitely high. Shining stars should exhaust their fuel in finite time and thus cannot exist in the infinitely old Universe — thermal death of the Universe. General relativity (GR) successfully hit both targets leading to the notion of expanding Universe of finite age, but created instead its own very interesting problems which we discuss in what follows. gravity to relativistic theory we could take, a priori as a mediator of interactions scalar, vector, or tensor intermediate bosons, confining ourselves to lower spins. Since we know that gravity operates at astronomically large distances, the mass of the intermediate boson should be zero or very small. Indeed, massless bosons create static Coulomb type potential U ~ 1/r while massive bosons lead to exponentially cutoff Yukawa potential U ~ exp(-mr)/r. Interactions mediated by vector field are odd with respect to charge parity transformation, C-transformation, and as one can see from the vector boson propagator, such interactions induce matterantimatter attraction and matter—matter repulsion, recall electromagnetic interactions. Hence, vector field cannot mediate attractive gravitational force. where GN is the Newtonian gravitational coupling constant. Such theory is rejected by the observed light bending in gravitational field, since for photons: T^ = 0. A small admixture of scalar gravity to tensor one, i.e. Brans—Dicke theory , is allowed. This equation is valid in the weak field approximation because the energy—momentum of h¡v itself should be included to ensure conservation of the total energy—momentum. Massless particles, as, e.g., gravitons, must interact with a conserved source. Otherwise theory becomes infrared pathological. The energy—momentum tensor of matter is conserved only if the energy transfer to gravitational field is neglected. Taking into account energy leak into gravity leads to nonlinear equations of motion and allows to reconstruct GR order by order. For a discussion of this approach see papers . R^V = gafiR^av?, scalar curvature R = g^VR¡v, co-variant derivatives in curved space—time D^, etc. The impact of gravity on matter is included into T V due to its dependence on metric and in some more complicated cases on the curvature tensors. Let us repeat that the motion of matter in the gravitational field is simply the free fall, i.e. motion along geodesics. Classical tensor theory of gravity agrees with all available data and is a self-consistent, very beautiful and economic theory. It is essentially based on one principle of general covariance, which is a generalization of Galilei principle of relativity to arbitrary coordinate frames. Invariance with respect to general coordinate transformation (which is called general covariance) is a natural framework which ensures vanishing of the graviton mass mg. Even if the underlying classical theory is postulated to be massless, quantum corrections should generally induce nonzero mass if they are not prevented from that by some symmetry principle. This is another advantage of tensor gravity with respect to scalar one for which no principle which forbids nonzero mass is known. Though quantum gravity is not yet understood, it is natural to expect that quantum corrections should induce mg = 0 in absence of general covariance. DßVv = OßVv - r«vV«. BOLOTINA N.N., TRAVKIN V.S. — 2011 г.
DOLGOV A.D. — 2008 г.
DOLGOV A.D. — 2010 г.